The idea of memorial renders neither an object, nor an event, but an emotion during Japanese occupation period of war. An emotion involves a sum of the historical event, historical icon, warrior, spirit, and value. "Wounds of War" memorial is configured into 2 main levels, the ground, and the above ground level. Interpreted from the representational meaning of colors in the Malaysian national flag, the formal composition is translated into braveness (red) and unity (blue) that form supports for visitors. 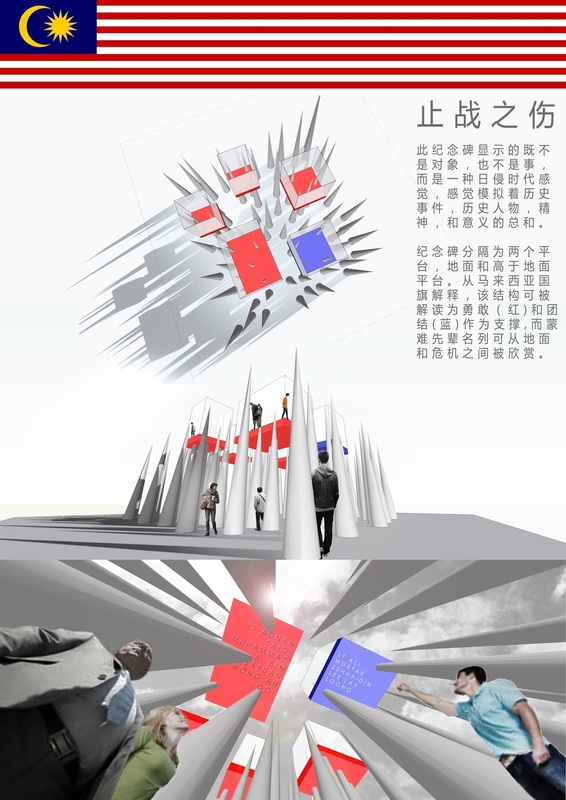 From ground experiential level, one goes through a forest of concrete needles that simulate the situation of danger. Out of the formal composition that gives effect to one that walks through the memorial, one can pay remembrance to warrior during the period of war by encountering of the indication and name list of warrior engraved underneath the red and blue planes.